This easy, light-tasting asparagus will even have your kids asking for more. 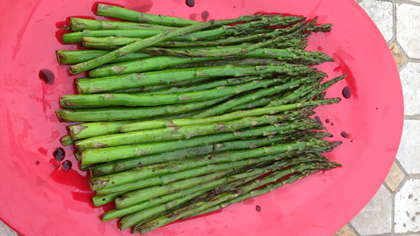 Wash, dry, and cut ends off asparagus. Toss asparagus with some olive oil, salt, and pepper until lightly coated. Allow asparagus to warm to room temperature. Place asparagus in a grill basket and place on the indirect heat side. Close lid. Grill asparagus for approximately 4-5 minutes until fork tender, turning with tongs to distribute heat evenly. Transfer asparagus to a serving tray and lightly sprinkle with balsamic vinegar (about 1 Tbsp). *You can put one finger on the end of your balsamic vinegar to help manage the flow.